End of Life Washington guides people in planning for the final days of their lives. We provide free end-of-life counseling and client support services statewide to qualified patients who desire a peaceful death. We encourage advance planning and set a new standard in Washington for advance planning documents with our End of Life Washington Advance Directive. We promote the use of Physician Orders for Life-Sustaining Treatment (POLST) for those with serious illnesses. We provide these and many other documents at no cost. We created and played a key role in leading the coalition that passed Initiative 1000 (the Washington Death with Dignity Act) into law in November, 2008 with nearly 60 percent of the popular vote. We now steward, protect, and uphold the law. We advocate for better pain management, patient-directed end-of-life care, and expanded choice for the terminally ill. We do not suggest, encourage, or promote suicide or euthanasia. People are frequently disappointed to learn that Washington’s Death with Dignity Act, and similar laws in other states, do not help people with Alzheimer’s or other forms of dementia. Our Death with Dignity Act requires that a person be mentally competent to choose a hastened death, and by definition, most people with serious, progressive dementia are not able to make an informed and reasoned decision about this subject. 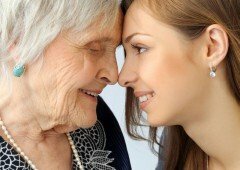 Additionally, dementia is not the type of medical condition that leads to a six month or less prognosis–the mind and body can slowly deteriorate for years with dementia, and death is often the result of a different medical condition. For years, End of Life Washington has offered information about the only legal option to hasten death for a person with dementia: Voluntarily Stopping Eating and Drinking (“VSED”). This option is only for persons in the very early stages of dementia who still have enough cognitive ability to choose between life and death and enough fortitude to see the VSED process through. (See a thorough discussion of VSED in the ‘Documents” section of this website or request more information on the process by calling our office.) The difficulty with VSED, besides requiring significant willpower and determination, is that a person with slowly developing dementia needs to choose to hasten death during the very early stages of the disease–while still legally competent and able to follow through on the decision. This means that the person might forego a few reasonably comfortable years of life in order to make the VSED decision and to carry it out before too much competence has vanished. Another problem facing people with late stage dementia is that care facilities frequently will push or cajole people to eat and drink beyond the time when the person is interested in eating. Caregivers often believe they have a duty to feed a patient regardless of that patient’s stated wishes. Caregivers often interpret a person’s opening their mouth when spoon fed as a desire to eat when medical practitioners tell us that opening the mouth is more reflex than an expression of a desire for nutrition. Almost all dementia patients eventually reach a stage where nourishment is unimportant to them. EOLWA has recently drafted “Instructions for Oral Feeding and Drinking,” similar to an Advance Directive, which express a person’s decisions about when to be offered food and fluids during late stage dementia, when the person lacks mental competence. The “Instructions” list several objective conditions which should be interpreted by caregivers as the desire to stop eating and drinking, and thereby hasten death. Success utilizing the “Instructions” depends on a supportive surrogate health care agent, who has power of attorney to make health care decisions, as well as supportive caregivers. Please see: “My Instructions for Oral Feeding and Drinking” and the explanatory “About My Instructions for Oral Feeding and Drinking” at the beginning of the “Documents” section of this website. If you wish to sign the document, persons from the EOLWA office can witness and notarize your signature. Please call for an appointment. A strong, independent woman suffering with terminal cancer and her favorite niece found themselves in an emotional conflict as the aunt approached her Death with Dignity decision. The aunt was not going to be deterred from taking her life-ending medication while the niece found it difficult to agree with her aunt’s choice, based on her own personal beliefs. Our Client Adviser helped facilitate discussions between the two. In the last few days her communications with her niece and her husband grew in frequency as they moved toward fully embracing the client’s wishes. On the aunt’s final day, her niece was at her bedside and held her hand as she slid into unconsciousness and beyond. As her aunt’s life ebbed, the niece told our Client Adviser that being able to be present at the death offered her great comfort. Then she shared that years earlier she and her husband had lost a 3-year-old daughter who died in a hospital out of her mother’s reach. “This moment has helped mend an old wound,” she told our Client Adviser. Early in the life of Washington’s Death with Dignity Act, one of our ageless, tireless and inspirational lead Client Advisers found herself helping a young woman use the law to end the suffering caused by her brain tumor. The client died without incident after ingesting her medication. As was the rule in those days, the Client Adviser was obliged to call 911 so medics could officially pronounce the death. When they arrived, the gaggle of hulking firefighters rushed into the house, intent upon resuscitating the client. Our lead Client Adviser, who has never weighted more than 100 pounds, stood in front of them and told them they could not do that. They insisted … she resisted. Finally she asked, “How many of you know about the Washington State Death with Dignity Law?” That drew a room full of confused looks as well as admissions that none were aware of it. She gave them a quick tutorial, they made some phone calls, continued a several-hour investigation, and then left the scene. The upshot of our lead Client Adviser’s own version of “Stand Your Ground,” was a new ruling by the King County Medical Examiner that future deaths could be reported without intervention by police or medics – a fact that has made life more comfortable for us and our clients. Not every case ends in someone’s death. In fact, a majority of our clients never use the Death with Dignity law. A long-term Client Adviser helped bring peace to one such young man who lived in another state but wanted to come to Washington to use the law. He had been diagnosed with terminal cancer, had rented an apartment in Seattle, and was researching flights to the Northwest. He intended to rush to see doctors, get his medication and end his life before the disease became debilitating. Over the course of about 3 months, he and our Client Adviser had many long conversations about his fears and doubts about his plan. He kept asking how to get used to the idea that he was dying. The Client Adviser recommended several books about death and dying, several of which he read and talked about. Gradually he began to realize that a person can live while they are dying. He sought support from family and returned to a long time hobby which gave him great pleasure. In the end he did not use the law. He told our Client Adviser he had decided to stop worrying about how he would die and, instead, set about to enjoy what life he had left. Along those same lines, a Client Adviser was assigned to a couple who wanted to rush and get the Death with Dignity medication as soon as possible. When he asked why they thought they needed the medication they explained that they hated the medical system, and so if one of them were injured or very sick, they wanted to take the meds before doctors took over and forced them to prolong their lives. At that point the Client Adviser produced a copy of End of Life Washington’s Advance Directives for Health Care, and told them that if they made their desires known and engaged a health care power of attorney, no one could force unwanted medical care on them. Their sense of relief filled the room like a tsunami. They remain alive and happy to this day. End-of-life planning is a big piece of our mission. A Client Adviser, Charlie*, faced a large Chinese family whose matriarch wanted to use the Death with Dignity law to quiet the pain she had felt for months. At one meeting the client, three daughters, three sons-in-law and our Charlie* sat around a table to discuss the difficult conditions that had gotten her to that point. Her life included escape from Communist China, a difficult process establishing a business with her husband, and making her place in this country. She said she felt very lucky despite the disease that was stealing her life. The whole room was held spellbound by her story. On her final day she drank her foul-tasting medication down like it was spring water and told her family that this was one of the happiest days of her life. Our team of Volunteer Client Advisers could tell hundreds of similar stories. And think about this. There is only one way these stories can continue to be told, and that is by keeping End of Life Washington viable and available. We need annual revenues of $500,000 just to keep the doors open with no frills! Your generous gifts keep us alive. Your willingness to make a Qualified Charitable Contribution or Appreciated Stock Donation keeps us alive. Your calls to Development Director Kathy Sparkman (206-274-9974 or ksparkman@endoflifewa.org) will continue to support us. Please remember these stories … and help us write more. Discussing end-of-life medical care can be really difficult for family, but especially so when the terminal condition is something like Alzheimer’s disease and you see the person you love disappearing before your eyes. Is the person still truly alive? Do they wish they were dead? It’s a situation my family is confronting. My father, Dan Ott, was diagnosed with Alzheimer’s in 2012, when he was in his mid-60s. What were once quirks became obsessions. He would hide my mother’s purse in the closet because he worried someone would see it through the living room window and break in to steal it. Eventually, he could not figure out how to use a telephone. It was a pretty quick decline, and I was losing the smart, funny guy I loved. Two years ago, I took my recorder down to Florida hoping to talk to him about his life, before the man I knew slipped away for good. I prompted him with questions about growing up on a farm in Iowa, joining the Air Force during Vietnam, and his four-decade career as a university fundraiser. It did not go well. He was missing huge chunks of his own biography. A few months after that conversation, we moved dad to a memory care unit and he’s still there today. He doesn’t even know that my mom died last fall. We didn’t tell him because we didn’t want him to grieve over and over. But her death has each of us in the family thinking about our end — and how we’d want to navigate it. Mom had emphysema, and during her last hospitalization she needed a ventilator. Doctors said she’d likely never get off the breathing machine, so Mom, who was very lucid, chose to withdraw treatment. My brother, sisters and I were all with her when she took her last breath. In six states and Washington, D.C., a doctor can prescribe drugs that will help end a person’s life. Many call it physician-assisted suicide or death with dignity, but lots of people have problems with those terms, so experts have started using the phrase “medical aid in dying.” It’s not an option for people with Alzheimer’s. To understand why, you have to understand how medical aid in dying works. First, you have to verbally tell a doctor you want it. That starts the clock ticking. Within 15 days, you have to find two doctors who agree you are terminally ill, will likely die within six months, and are competent. Then you have to submit a written request for life-ending medication that has to be witnessed by two people. The doctor holds onto the prescription for 48 hours before snail-mailing or hand-delivering it to a pharmacy. Gregory Pence, a bioethicist at the University of Alabama at Birmingham [UAB], says it’s complicated even if people clearly expressed their wishes back when they were competent. Even without medical aid in dying, some people with dementia find ways to end their lives on their own terms, says Wendy Walters, the clinical ethics consultant for UAB Hospital. Recently, she reviewed the case of a man diagnosed with early-onset Alzheimer’s. He had helped care for his mother-in-law, who also had the disease. It wasn’t the life the man wanted, so he shot himself and was left with massive injuries. The family wanted to withdraw life support. Walters supported the plan. In another case, Walters says, an elderly woman with Alzheimer’s was reliving the Holocaust, and every moment was terrifying to her. These kinds of cases are causing some ethicists and medical professionals to ask whether health-care systems should offer more options to people with the disease. My sister and I don’t know whether Dad would have chosen medical aid in dying, but we all are confident he would have at least wanted the option. So, she says, in a lot of ways we seem to give animals a lot more respect, comfort and care than we do the people in our lives.